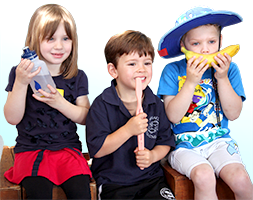 How can we improve the oral health of children attending our service? Early childhood services such as kindergartens and day care centres play an important role in promoting young children’s oral health. Early childhood is when many lifetime habits are established and offers the opportunity to prepare for good health in later years. As young children learn and develop they are constantly exposed to new experiences and respond by developing new behaviours and skills. The Smiles 4 Miles program helps services put in place simple strategies to promote good oral health and healthy eating habits among children, which supports and enhances existing structures, programs and practices . The Smiles 4 Miles program encourages a way of thinking and working that is adopted by the whole service in order to make it the best possible place to learn, work and play. The program encourages thinking broadly and creatively about what is happening in the service and what can be done to help make improvements to create an environment that supports oral health. Smiles 4 Miles can help meet the requirements of the National Quality Standard and related documents and has strong alignment to the Early Years Learning Framework for Australia and the Victorian Early Years Learning and Development Framework. Can I register my services in Smiles 4 Miles? To participate in Smiles 4 Miles, there needs to be a dedicated Coordinator within your local area. To find out if your area has a local Coordinator, contact the Smiles 4 Miles team.